I love Hard Times. It is possibly my favourite Dickens novel. Aren’t you glad that that’s what I took from this post? No, actually, I sympathize strongly with you on this. I actually do live a fairly minimalist life, but the books … oh, the books. I do pare my collection down every couple of years, and it’s always hard and painful, and I use a lot of the same reasoning that you do. Mostly, I keep things I know have a good chance of ministering to (aka serving) others if I lend them out, or that I will reread or just pick up and skim for the joy of it. So the books I have loved, and the books that shape me as a writer and as a disciple. In that books actually collect thought and personality and to some extent spirit, I don’t see them as being quite the same as, say, an overflowing Tupperware cupboard. But I only want to keep the books whose spirit is worth immersing in. By the way, it was lovely to see you for two seconds last night, and I look forward to seeing you for longer than two seconds shortly :). Oh yes! I can so sympathize with the books thing. Spring of 2011, after returning from visiting my parents in Florida, I decided to do a big purge. My parents house seemed so open and relax, mine did not. I decided I had too much “stuff.” I worked on it throughout the year and got rid of a lot. Then came the books. Ah, that was a tough one. There were so many books I had for sentimental reasons. I had lots of little books from backpacking in Europe. They were photo collections and history on the great castles and cathedrals and other places of note. I realized that I hadn’t looked at one since my return to the USA in 2001. Why would I keep them now? For the same reason you kept your academic books. I felt they were proof that I was well traveled and well-rounded. LOL. When I realized that, I got rid of almost all of them. I kept all the ones on Ann Frank because I felt it was important history and I wanted my daughter to have access to them one day (I was pregnant by the time I got to purging the books). I did get rid of almost all my classics, but that is because they are free digitally. If I can have the same book on a little digital device, then it takes a lot less room. There are a lot of books that I’ve saved from childhood for my children one day. I kept most of those. I got rid of most of my textbooks that weren’t from my field of study (theology). I kept those because I still use them when I write Bible Studies and so forth. Plus, I still hope to someday (after kids are grown) return to school for a PhD and maybe teach or write on the topic. I didn’t get rid of DH’s textbooks because he still wants to keep them. His doesn’t actively do much in the field of History, but still wants to keep those books. That’s his choice. We still have more books than will likely get re-read, but what are you going to do? Going forward though, I am buying mostly digital books. They take up no room and I can read them whenever I feel like it. Rather than ending up in a long wait somewhere wishing I had brought my book with me. Plus, that removes the temptation of having a book to “show” people how I’m this or that. If I find a book really good and think I’ll want to lend it to folks, then I’ll purchase a physical copy. But yeah, I’m addicted to books too :) I hope that in this digital age, my daughter will still grow up with an appreciation for the written word. I’ve been thinking about how I could reduce materialism in my life for a long time now, and every time I mustered the ambition to do something about it I would look at my books and question whether I would survive their absence in my life. But, you give me hope, Kathleen, and other commenters. I like how Rachel Starr Thomson put it: “but I only want to keep the books whose spirit is worth immersing in”. So, I am going to donate every book that I did not enjoy or that did not affect me in some positive way. Hence, I will not need an overly massive bookshelf to hold all of my books, which will save me money and space. What’s funny, is that even now in my moment of pure ambition, I’m practically hyperventilating at the thought of never seeing and holding some of my books again! Wish me luck! We were able to bring a very small amount of personal belongings with us to Baku. Our house is furnished here, so that combined with the weight restrictions forced us to pack barely enough to fill the tiny garage. We purged our books 2 moves ago, and it was painful. I think we were both keeping books because of what we thought they said about us. Brian had all these old books on golfing and lifting weights that I’m pretty sure he’d never opened, and I had all these college textbooks that I felt made me look smart (an important point to prove when your husband and many of your mutual friends are Harvard grads and you aren’t) and liberal (an important point to make when most of your non-Harvard friends are ridiculously Republican). I admit that I got rid of them just because we were moving, not because I had an epiphany of some kind, or became more humble or mature, though. Dang it. If it makes you feel any better, I count by books by the book *case* not the book shelf, so you seem positively restrained in your collection! I failed to mention that I didn’t even touch the other book case in the other room . . .
Heredity or environment, though. My dad was in the Navy. The Navy pays for all your moves. I don’t think he ever got rid of a book until after he retired and had to move them himself…and he still kept most of them. So many books everywhere. But the thing is, I *loved* that. I have so many fond memories of sitting in one quiet corner or another perusing the bookshelves. Picking out all kinds of random things, from collections of children’s stories from the 1950s to 1970s sci fi novels to the various classics both parents had around. There was always something to read, something different, something old, something no one else had heard of, because there were just so many books everywhere. And I kind of want that for my kids. Even though I know that floor-to-ceiling bookshelves in every single room filled with books when I’m only 26 is maybe a bit excessive…. Plus, you hit the nail on the head. A lot of books I keep because of what I think they say about me, that I’m smart, well-read, that I’ve studied such-and-such topic. It’s true that all my English and history major books, all my books in German and Latin, I keep out in the public rooms, and all my sci-fi/fantasy novels I keep in my bedroom. But when I’m looking for a book to read, I’m much more likely to re-read /Dragonriders of Pern/ then /Concise History of Ancient China/. Sigh. But I paid so much money for a lot of those books (anthologies and weird history texts), and they would be hard to find again if for some reason I want them! So I tell myself. Excuses excuses. T-Rex isn’t even born yet and we have three full shelves of children’s/YA books for him. It’s an addiction. I’m torn between the appeal of buying digital books that take up no space (guilt-free packratting, I love the digital age) and the uncomfortable truth that I have a hard time spending money when I have nothing to show for it–that is, nothing to put out on the shelf to prove that I’ve read it. Kudos to you, Kathleen. Even one shelf is quite an accomplishment! Oh man, Katie — the idea that the digital age facilitates “guilt-free packratting” is something I’d never thought of, but it’s SO TRUE! I can’t believe you were able to do this, Kathleen! I know you didn’t get rid of many, but wow, way to take a hard look at yourself and your books! I decided to pare down by getting rid of all my linguistics textbooks. My husband really didn’t want me too, in case I do ever decide to teach someday (a great point – then I can just use examples from old books and not have to come up with more on my own!) but at this point I’m fairly certain I won’t, so they’re just a waste of space. But you know what, now that I’m typing this, I can’t remember if we did get rid of them or not. That’s what happens when your move is covered by a moving company, I guess! I do the same thing, Elizabeth — I always check a book out from the library before buying it (when possible), to be sure it’s a good purchase! I completely understand your inner battle. I often have the same issue getting rid of things that remind me of who I once was. I’m now a father and a husband and it seems that I have no passion. I hang on to things because it reminds me that I was someone before I began to fill a role. Then, I interact with my children and it reminds me that I am no longer an athelete or the popular guy but I have my very own fan club because I try to be a good father. It is for this reason that I understand when people say that God has been better to me than I’ve been to myself. He has given me the love of a wife and children, something that can easily replace the self image I gain from some of my possessions. Hi I’ve just come across your blog today. So much good information on here. You’ve kept my attention for hours:). I stumbled on it looking for more info on no-poo. I have been washing my hair less and less. First it was a bit of laziness, but then my scalp started to feel better, and my hair didn’t look bad. So I tried no-poo yesterday and my scalp is itchy so wanted to find out why. Think I didn’t rinse the backing soda well enough. 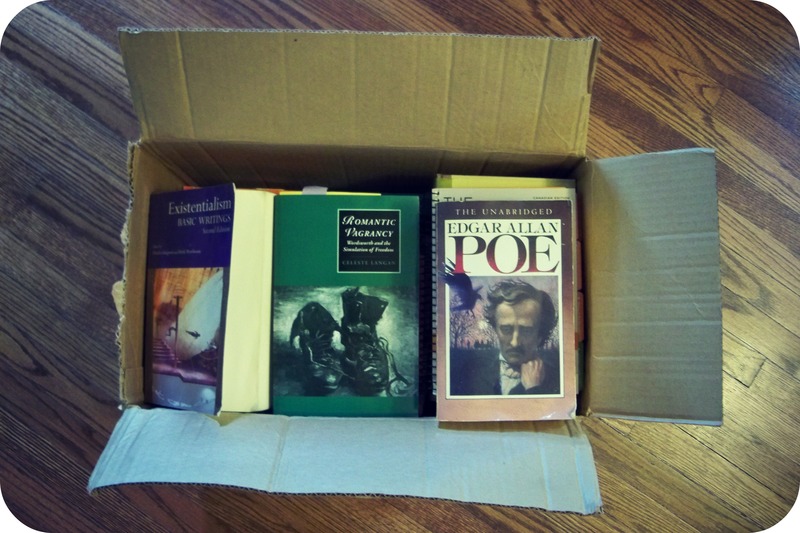 Well that and the fact that I used the whole cup, oops:) Then I saw this post on getting rid of books. It hit home. I am a book lover and had kept every single book I ever had in my adult (from university days) life. I wanted to make a “library” in my home. Not to lend out just for me, and then when I saw in your post about people thinking you were well read that hit home. My book hoarding, for lack of a better word, problem was partially solved for me when about half of them got ruined with damp and mold (why I listened to my dad when he said “they’ll be fine out here in the Quonset hut in paper boxes” I’ll never know). All my teaching resources that I had stored got ruined too. But what sent me over the edge was seeing my Harry Potter books ruined. I lost it, sat down and had a good cry, cried while I watched them burn and mourned the loss of my library. But then, something magical happened. I was ok. I felt kind of free. (Ok I was still distressed over my read-aloud books and teaching stuff) in fact I felt so free that I donated the rest of my books. I kept the one one Harry Potter book that wasn’t ruined, and my cookbooks. That’s all. Like you I would try to cull from time to time and end up saying “but I might need to look up something in my intro to psych book from 10 years ago” and I would put it back on the shelf. The experience of seeing my ruined books and subsequently burning them (the only time I advocate burning books!) freed me and helped me to just clear out the literary clutter. I’m really enjoying all of your posts, and this one strikes a chord. I’ve had a love of books (and a love of owning and enjoying books) that led to a whole room dedicated to storing them accessibly. As I grew older and realized how much time and energy my belongings were sucking away, I realized how much my walk with God had been compromised by my belongings. I began to strip away everything that didn’t have current meaning and value. Purging and refining my personal library was emotionally challenging, and I shed a lot of tears over lost hopes and dreams in the process. But it was emotionally freeing for me, too. I’ve got a clearer vision about why a book should stay and when/why a book should find a new owner; all my mini-book-purges since then have been practically enjoyable! Oh man I hate getting rid of books. I never know what to eliminate b/c I’m still in college, just graduated w/ an A.A. last June. I studied Social Science, but I’m transferring to a university in Thailand for my B.A. and eventually M.A. in International Relations this year. Many of the books are about history, Christianity, German, and China. I want to pursue God w/ everything I got, including my reading habits. Books can be used for research and entertainment. No need to spend more for future books. I will get rid of my comic books, sports cards, and other childish memorabilia, but books are tough. I’m stationed in the Middle East right now, and I fully understand the importance of packing light. If I travel to Thailand w/ Jesus, I may just need to eliminate a vast array of possessions including my precious books. No worries then. Rhetorical questions: What do we eliminate? How do we determine what to donate? Emily, I love this post SO much. Identity in books – man, I deal with this often, and I’ll be frank and say your post was convicting, so I’m not sure I have any answers for you haha. When we moved into our new house in Rome, book were the only thing I had to decorate with. After living in 365 square feet (that 2 car garage) for such a long time, books were on my short list of possessions. So, I would use them to decorate. Being a little overly self-reflective, I was like, “I will not try to impress people with my collection! 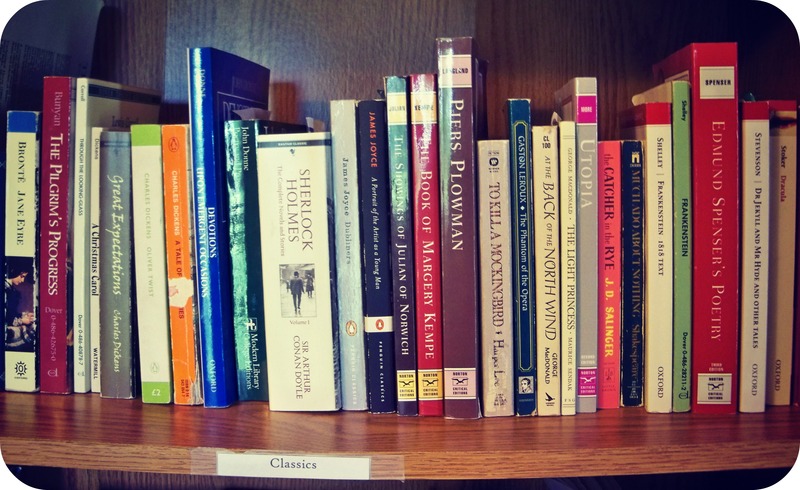 I will put classics next to the pop culture best-seller.” Ironically, I was still trying to define WHO I was with my collection… I told myself, “I will be shocking, diverse, drum up conversation about how I could like both of these by putting them next to each other.” But ultimately, I was just doing a different version of what you are describing – finding identity in books. As you may also remember, I often color-code books on shelves. We have very little art work in our house, and so I sort of use the books I have as art. I once had a friend say, “I can’t tell what any of your books are because I’m so distracted looking at the colors. How do you ever find anything?” Maybe color-coding is an anti-book identity trick? I will admit though… I am not a keeper of books I hate for sure, and I am not much of a re-reader. I keep some books that I get quotes from often or that just warm my heart, but I tend to use my collection like a library itself. You’re probably wondering what I mean… well, living in a very small town, it can take weeks to get books I want to read from the library. There are almost always long reserve lists (not for the classics of course haha). My mom was a avid book-trader, and after watching her early in life, I immediately got to college and found the nearest used bookstore that would take trade-ins. Maybe they’re not worth much, but befriend a book-trader and they will keep an eye out for books you want to read. In Auburn at the Gnu’s Room, I constantly had credit because I was always bringing books in. And if you’re always trading out for a new book, you’re not really ever gaining books… So a lot of the books on my shelf are things I haven’t read yet, so I can’t claim them as identity either haha. I TOTALLY get it. But I love everything you say, so I’m keeping it. :) Blessings! Paring down my books turned into a procesz. The first time, I went through the same thing (but doubt I got rid of a fifth.) Then a couple more. Finally I moved them front and center on a bookshelf where I have to look at the every day. I would guess I am down to a third of what I once had.